A look at trailering before and after you buy the trailer. You're the owner of a collectible automobile. Great. You either want to show it or participate on tours. Whether you've owned it for years or recently acquired it, you now have to decide the best way to have your collectible transported. Professional transport services are convenient, but are not for everyone. If you're considering buying a trailer to transport it yourself, the following tips are offered before and after you purchase one. Goose-neck trailers are not addressed here although some of the tips maybe applicable. This applies to pull trailers also referred to as tag along trailers. 1. Open or Enclosed Trailer — An open trailer has several advantages such as less weight, less cost, and even ease to tie-down the vehicle, but the enclosed trailer offers security and protection from the weather. 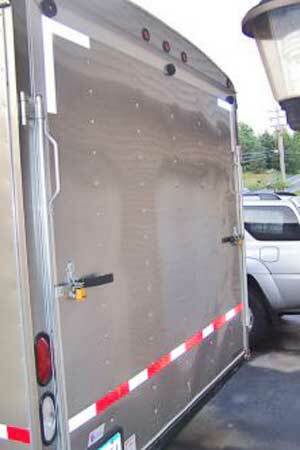 Plus the enclosed trailer shields your precious cargo from tempting eyes while enroute or overnight at a hotel. 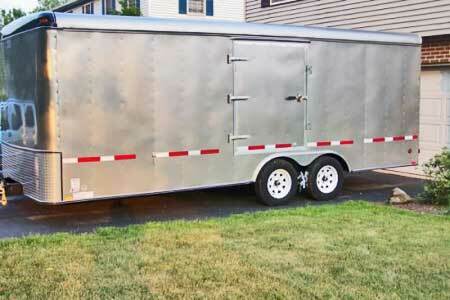 Peace of mind easly justifies the roughly $3,000 more you'll pay for an enclosed trailer. Also, there is a slight improvement in gas mileage when pulling an enclosed trailer, so the decision, based on cost becomes even easier. 2. Weights — Gross Trailer Weight (GTW) — The Gross Trailer Weight is the total weight of the trailer and the cargo, which is the vehicle weight plus any accessories and ancillary items such as tools. Most two axle enclosed trailers weigh approximately 4,500 pounds and handle 10,500 pounds GTW which leaves approximately 6,000 pounds for vehicle and cargo. A full classic weighing 5,200 pounds doesn't leave a lot of room for extras. Consider a trailer with 12,000 GTW to increase your weight margin and can be as simple as ordering the trailer with larger tires and/or axles. Now another term: Gross Combined Vehicle Weight (GCVW) is the maximum allowable weight of the entire rig, loaded and ready to go. It includes not only the weight of the tow vehicle, but also its fuel, passengers, luggage or cargo, the dog, plus the weight of the trailer and everything inside. This results in manufacturers publishing a Gross Combined Weight Rating (GCWR). This is the design metric used by engineers to size things like the cooling system, engine and transmission, axle ratio and brakes. Take the time to understand these weight terms when choosing the trailer and tow vehicle and how they may affect suitability for your purpose. 3. 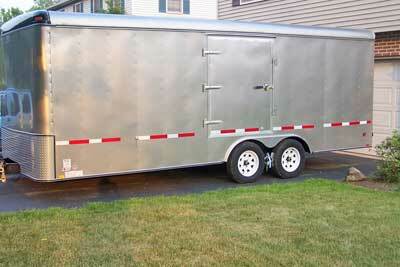 Door Height — The height of the rear door should be considered when purchasing a trailer. Is a door height of 7 feet enough? Since some collectable cars of the "teen era" tend to be higher than a standard 6'8" garage door, then you may require a larger trailer with a higher door. If you think you will never trailer a tall car, stay with a standard height. 4. Inner Fender Well Height — Does the trailer you're considering have an inner fender well? Will you be able to pull your car in and open the door without hitting the inner fender well? Ideally the door should swing above the inner fender well. 1930's cars probably have enough clearance, but low slung 1950's and 1960's era cars may not. This would force you to climb out the window once inside or add/raise the height of the floor to get the necessary clearance, perhaps using wooden planks for added clearance. Consider details such as this when purchasing your trailer and determining how you're going to use it. On each side of the inside of the trailer are the wheel wells. These may be high enough to limit movement of a car door when trying to open it after that car has been pulled in. Exiting out the window can be frustrating. 5. Hitch System — Another thing to consider when buying your trailer is the hitch system. Here are two terms to think about: Weight Distribution and Sway Control. Weight distribution is the hitch system's ability to transfer some of the trailers weight to the tow vehicle's chassis. When the weight of the trailer (called tongue weight) is added to the rear of the tow vehicle, the rear of the tow vehicle will be lowered under this weight. The tow vehicle can more than likely handle this weight, but it does alter the tow vehicle's original posture and its handling properties. In an extreme case, the downward pressure of the trailer weight behind the rear wheels of the tow vehicle can cause the rear wheels to act as a fulcrum, causing upward lift on the front front wheels reducing front wheel contact with the road. This can drastically affect steering ability, especially on wet pavement. 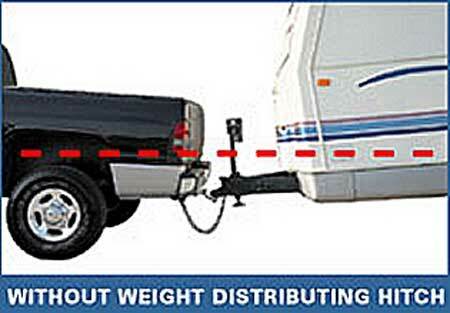 By including a weight distribution hitch system, essentially you maintain the tow vehicle's posture as if the trailer were not connected. 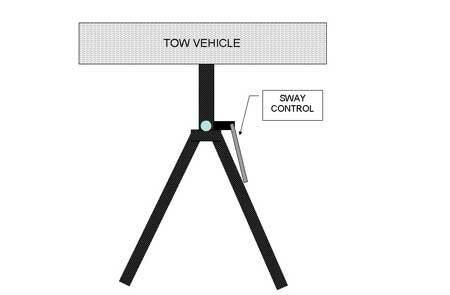 Sway control minimizes the trailers movement that pivots around the hitch ball. The practical benefit is when being passed by other larger vehicles such as a semi-tractor trailer truck, the trailer's side-to-side motion caused by the passing truck will be minimized. Sway control is of such importance to trailer towing safety it should be mandatory. Reese or Equal-I-Zer hitch systems offer BOTH weight distribution and sway control features. Take the time to understand these two features and how you'll include them into your truck and trailer. The effects of a tag along trailer on the tow vehicle without weight distribution bars. In an extreme case the front wheels could lift off the pavement and the tow vehicle could lose control. The same tag along trailer with weight distribution bars. The bars literally lift the hitch up which applies pressure onto the tow vehicle's front tires. A separate control arm is included between the trailer's tongue and the hitch system. Some are friction based while others use a hydraulic cylinder. The effect is the same, it keeps the trailer straight. An account of one collectors experience using a Robins Hitch System which resulted in an accident on its maiden voyage. It is recognized by the smooth bent bars held in place by keeper clips. My words of wisdom are that an accident is rarely just a single thing that goes wrong. It's typically a cascade failure, as was my crash. Being fairly new to towing I can't blame my accident totally on the hitch. I didn't realize the extreme level of tension required to make a torsion bar system work. What happened in my case was that I came over the crest in a road and the torsion on one of the round bars unloaded and the bar dropped out of the socket. That was my fault for not properly torquing the bar. However, had the round bar hitch been machined properly the keeper tab would have kept it in place and we may not have crashed. When the bar unloaded and the weight of the 10,200 pound trailer came down on one bar the dynamics of the whole trailer went awry and we started swerving so bad I looked out my side window and saw my trailer. We swerved 4 times before I was able to straighten out the pair by using the trailer brakes, only. That had us headed for a ravine so I swerved and sideswiped the guard rail ripping loose the classic 356 in the back, causing it to slam into the inside of the rig. Had the sway bar not come apart I might not have crashed, but I certainly set myself up by the way I loaded the car. I balanced the rig, but failed to account for the fact that the Porsche is rear-engine, putting a lot of mass at the rear of the trailer. When the hitch stopped providing sway control the 35-foot long trailer just became a giant pendulum and overcoming that body in motion was the hardest thing to overcome. The forces at work were so great that the F-450 dually was up on a 30° angle which bent the 2" square stinger 10° in two directions. The next year we made the same trip with the same car and different sway control and the trailer performed flawlessly. " 6. Braking system — Braking systems used on larger two or three axle trailers should be researched and understood when selecting a trailer. The two most common types are Hydraulic and Electric. The purpose of the trailer's braking system is to allow the trailer and its cargo to brake on its own and not rely solely on the tow vehicle for slowing or stopping. Hydraulic brakes are applied when the trailer senses movement at the hitch and that movement is translated to the hydraulic master cylinder, much like stepping on a brake pedal. The more movement (harder stop), the harder the master cylinder operates and the more the brakes are applied. Electric brakes are quite different. A separate control in the cab of the tow vehicle senses the electrical connection of the brake pedal and applies a regulated amount of electric current to the brakes on the trailer. Most electric brake controllers have easy adjustments for the driver to apply the right amount of braking when the brake pedal is depressed. If using electric brakes, investigate how the controller is installed and how it will be used. Starting in 2005, Ford offers a built-in brake controller system on larger pick-up vehicles such as the F-350 models. Other brands may offer a similar feature. 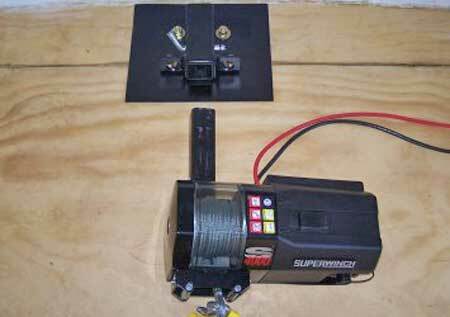 Electric brakes also have a safety switch feature (lanyard cable) that applies a separate electric current from a small battery mounted on the trailer's frame that engages in the event the trailer separates from the hitch and needs to stop on its own. Either system, when operating properly should stop the trailer evenly with the tow vehicle slows down. Electric brake systems require a controller to adjust the amount of current when the brakes are applied. Many trucks now include this controller as when a towing package. 7. Left side door — Having a left side "pass door" over the axles is a handy feature. It permits easy egress out of the vehicle once it is parked in the trailer rather than having to shimmy down the side and out the back. This is standard among some models and is worth while even if it has to be ordered as an option. Side view of a tag along trailer showing the convenience of a side door on the left side to exit the vehicle after it's in the trailer. 8. Front Pass Door — A thin pass door on the front passenger side of the trailer is a necessity to gain access to the front of the vehicle to attach the hold down straps. Most manufacturers offer this as a standard feature. 9. Spare Tire — Where should you mount the trailer's spare tire? Locating the spare in a hidden floor compartment saves space, but can be havoc if you need it and there is a car over it. Mounting it up front against a wall may take up valuable space. Be sure to give this some thought when ordering your trailer. 10. 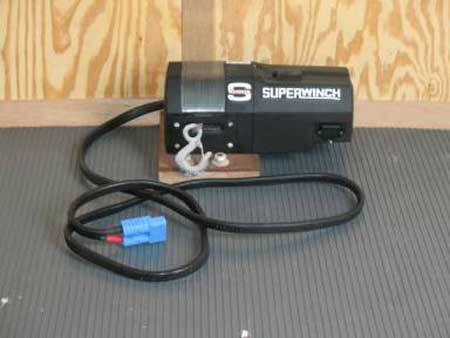 Electric Winch — Including an electric winch in your trailer is a good idea. Should your vehicle break down, the winch will be a great asset to pull the stalled vehicle into the trailer. 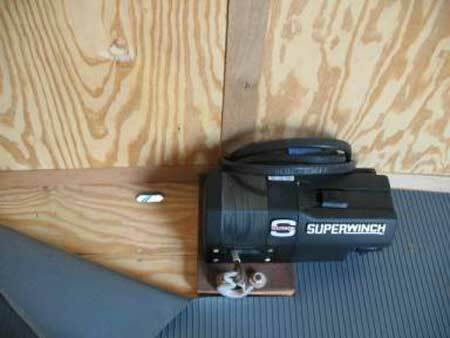 When considering a winch, make sure 1) it's mounted to the frame (e.g. U bolts over the trailer's frame or channel), and 2) run adequate cable (suggest 8 gauge or better) from the tow vehicle battery to a specialized two prong quick disconnect at the tow vehicle's rear bumper to power the winch. 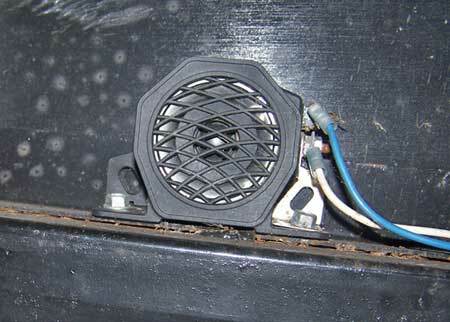 A little hole opening in the trailer's floor adjacent to the winch can be used to route the power cable out to the quick disconnect. 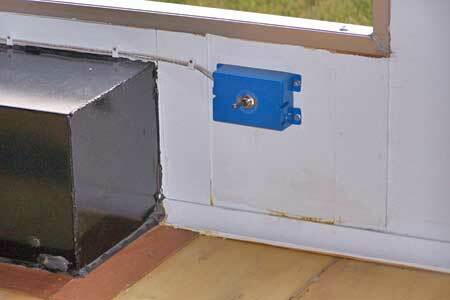 The hole can be protected by a wooden or rubber cover when the winch is not in use. Another option for mounting the winch is to include a class 4 or class 5 hitch receiver into the design. The receiver is firmly mounted on the trailer's floor and the winch with its square tubing slides into the receiver and secured by the same pin and clevis clip as a regular hitch. Advantage of this detachable winch version is that the winch can be used on the tow vehicle's hitch receiver (trailer disconnected of course) if the situation arises. The electrical connection would be the same two prong heavy duty disconnect plug as if the winch were inside the trailer. Electric winch mounted at front of trailer. Winch with access hole for electric cable revealed. 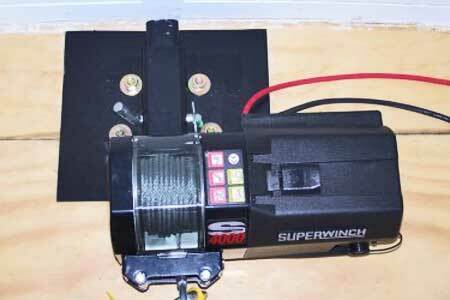 Electric winch mounted using hitch receiver. Electric winch shown removed from the hitch receiver. 11. 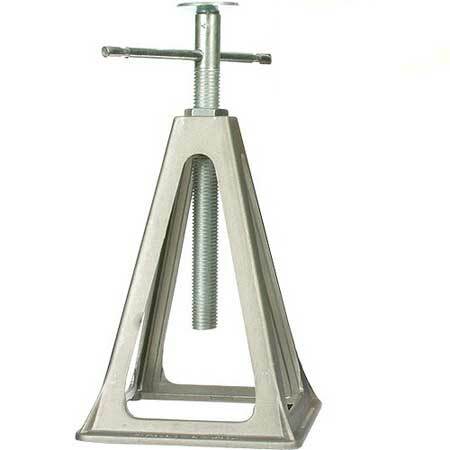 Trailer Tongue Jack — A trailer tongue jack is essential to lift the trailer's tongue off and on to the hitch ball. Most tongue jacks are manual wind style, but where its mounted is especially important. A convenient location is right behind the trailer's tongue. If the tongue jack is located on the outside of the frame rail with a swing up feature, it may interfere with the hitch's weight distribution bars, forcing you to have to remove or reattach the jack each time the weight distribution bar is installed. An added convenience is an electric tongue jack and can be powered via the same two-prong quick disconnect electrical plug used for the winch. Pay extra care about height and location of the tongue jack that it does not interfere with any part of the tow vehicle such as the drop down tail gate or door on pick-ups or SUV's. 12. Tongue Weight Scale — Consider purchasing a tongue weight scale for use when positioning the vehicle inside the trailer. 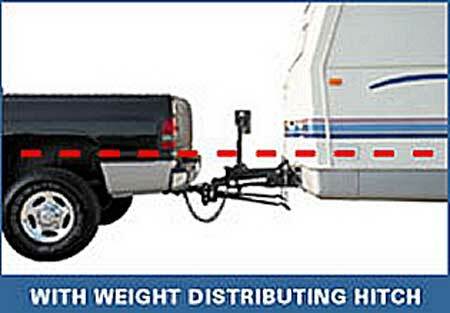 Moving the vehicle back and forth will increase or decrease the effected weight on the hitch ball. Too much weight will alter the tow vehicle's handling and not enough weight may cause the trailer's tongue to lift up off the hitch ball. Once the vehicles location is established, a mark on the trailer's floor or a stop can be fastened, assuming its the same car each time. These cost approximately $125 and are offered at camping trailer sales locations. Perhaps you can borrow one and do it once. A relative tongue weight is at least 500 pounds and should not exceed 1,000 pounds which is the limit for most hitch systems. The tongue weight scale from Sherline. 13. Tie Down System — Consider using the E-Track Tie-Down System. E-Track is a heavy gauge metal cargo securing system that when used with E-Track clips and straps, secures the vehicle to the trailer. Since E-Track has multiple connection slots to place the clips, it permits holding the car more securely while in transit. E-Track should be installed so it's connected to the trailer frame and not just the floor. E-Track can be purchased through McMaster-Carr Industrial supplier or other truck-trailer-cargo vendors. A simple computer search under "E-Track" reveals many. And don't forget the E-Track clips/straps along with the regular 2 inch wide Tie Down ratchet straps and special double ring straps that wrap around the suspension and axles. E-Track is a convenient method for securing the vehicle using ratchet tie straps. E-Track Clips are available with loops and straps with D rings. 14. Flooring protection — Since most collectible cars leak a little, consider protecting the floor with either an epoxy paint or suitable floor covering for easy clean-up of oils and spills. 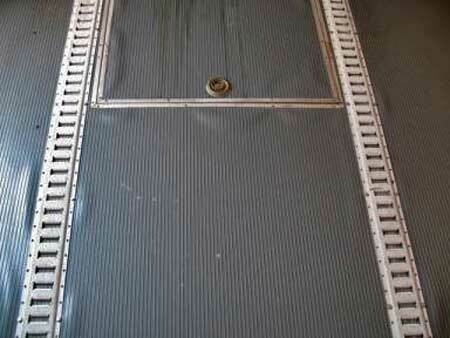 One such covering is a vinyl floor sheet by Better Life Technology, LLC, Lenexa, Kansas. Also consider traction needs when covering the door (ramp) as well. Tip: Put down the E-Track over the vinyl covering. 15. Back Up Lights and Back Up Alarm — An important accessory that can be useful on your trailer is a set of back-up lights and back-up alarm. The lights can be wired traditionally as back-up lights and/or as accessory spot lights while loading or unloading in the dark. Consider carefully where and how to mount these lights. Mounting them below the frame might break off when encountering a valley or hump on the road and mounting on the door may be a problem when the door is down. Another mounting method is to recess them into the door, if the door can accommodate them, but doesn't offer general lighting when the door is down. If you choose a flood light arrangement, a separate relay may be needed. Most tow vehicle reverse light switches/circuits aren't designed to handle a lot of current. 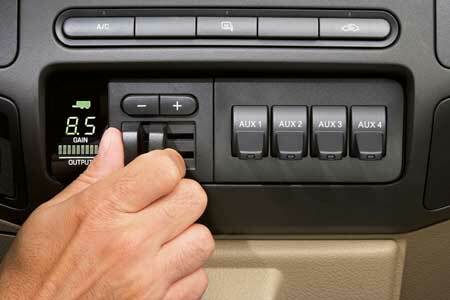 The back-up alarm can be as simple as mounting the speaker or siren under the chassis. A situation to think about is when backing up into your own driveway late at night. Do you really need to announce yourself to the neighbors with the backup alarm going? Adding a backup alarm kill switch in a convenient location like just inside the pass door or a weather proof switch located on the trailer's tongue frame maybe more convenient. Temporarily disabling it may keep you on good standing with the sleeping next door neighbors. This back up alarm is mounted on a frame rail under the trailer floor. Some waterproofing is advised. A back up alarm kill switch is advised to disable the alarm when it is not wanted. 16. Mirrors — The mirrors on your tow vehicle are an important safety accessory. Using the driver and passenger side exterior mirrors provide the driver an instant perspective of the surroundings. The driver must learn to depend on mirrors and gauge where traffic is in relation to the trailer. The most common occurrence for mirrors is lane changes. Exterior mirrors on many of today's tow vehicles simply pull out (extend) to accommodate the extra viewing area needed for seeing past or alongside the trailer. 17. Video Camera System — A video camera system can provide the driver with extra comfort while towing by seeing whose following behind the trailer. This is much like the camera system used on motor homes, but instead the camera is mounted at the rear of the trailer. 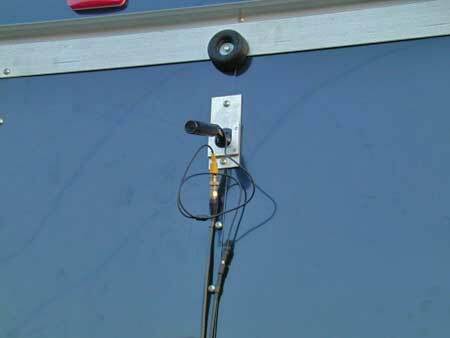 The camera can be mounted high up on the rear door with a quick disconnect clip or on the roof of the trailer. Small bullet cameras such as Swann's SW-C-CCBC is outdoor rated and operates on 12 volts. If it's mounted to the rear door, remember to remove it when lowering the door. Small 5-6 inch TFT-LCD video monitors such as the Valor VH-700WR, Emerson MT-1563, or Accelevision LCDP56 can be used. It's important to remember that with a video-camera monitor system, left and right are switched and thus the selected monitor must have a mirror or reverse video mode to correct left and right confusion. The Bravo-View MR-04F system includes the camera and entire rear view mirror which includes the video monitor inside the mirror. Benefit of the Bravo system is that when the camera is off, the rear view mirror is totally usable again and also has the reverse video mode. Wireless camera systems are possible, but a hard wired system using coax cables and metal BNC connectors (a bayonet twist-on connector) should provide years of worry-free service. Another benefit of a video-camera system is to temporarily mount the camera (using a magnetic mount) to the rear of the tow vehicle and the camera facing the hitch-ball. Backing and aligning the tow vehicle hitch-ball to the trailer exactly the first and every time has never been easier. You can now through away that tennis ball alignment system! 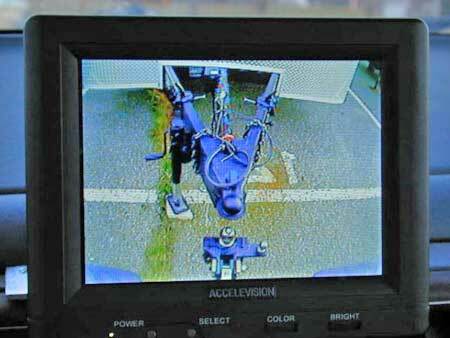 The bullet camera is mounted with as slide clip high on the trailer. Two connections are required, 12 Volt power and video signal, both satisfied using coax cable. Having a rear-view monitor on a the tow vehicle also has the benefit of making things easier when hooking up the trailer. Remember that the monitor you select must have Reverse Video function to correct for left and right. 18. Cargo and Tie-Down Straps. Always inspect straps prior to each use. Webbing that is cut, frayed or abraded should be replaced immediately. Never use any oils, solvents, acids, etc. on the webbing itself. When necessary only lube the mechanical workings of a ratchet or cam buckle with a lightweight lube such as CRC Dry Film Lubricant or other Teflon based spray lubricant. Use only top quality straps and webbing with UV protection. Sunlight is still a killer. When not in use, don't leave your straps laying around on the deck of your trailer in the sunlight. Ideally, store them in a cool dry location. This will greatly prolong the life of your straps. Be careful of how your straps are routed. 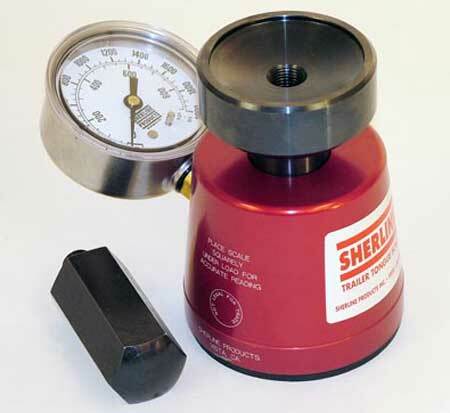 Avoid sharp edges or abrasive surfaces whenever possible. If this cannot be done, make sure you add some protection between the webbing and the surface in question. Cleaning your straps with warm, soapy water and a good scrub brush is the best method. Once the cleaning is complete, hang them up to air dry. Avoid cleansers with bleach or acid as these will weaken the webbing. Consider the method you use to tie down your vehicle using the ratchet straps. Straps that run in-line (straight front-to-back) would provide ample holding power front to back, but straps that also criss-cross will provide extra side-to-side control. 19. Reflective Tape — Using Reflective Conspicuity Tape on the outside of the trailer improves the visibility of the trailer to others on the road. Use of this tape is even more important if the trailer is a dark color or one that easily blends in with one's surroundings. 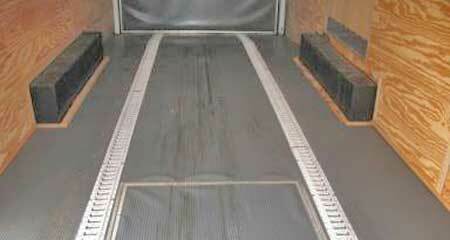 This tape is required on all commercial trailers but is not required in most states on car trailers. It is available in various lengths and in kits and is very easy to install. Strips of reflective tape on the back of the trailer. 20. Accessory Interior and exterior Lighting — Enclosed car trailers can be very dark places especially at night. Most trailer manufacturers offer optional interior lights at a nominal cost. Interior lights can also be added later by the trailer owner. In most cases interior lights are run off of the tow vehicle's electrical system. Having these lights wired that way can result in a dead battery in your tow vehicle if you leave the lights on too long. Some trailer manufacturers or trailer sales dealers offer an optional battery to power interior trailer lights. These batteries are usually deep cycle marine batteries and are usually mounted somewhere on or in the trailer. They can be wired so that they are charged by the tow vehicle when it is running and not drain the tow vehicle's battery (see TBCM below). Another tip for improving interior lighting - paint the interior walls and ceiling bright white to improve reflection. LED Lighting systems have improved where light output has improved and cost has come down where including LED lighting maybe a viable option for the interior lighting and will be less drain on the accessory battery. Battery dedicated to interior lighting along with a fire extinguisher in a handy location. 21. Trailer Battery Charging Module — Consider including a Trailer Battery Charging Module (TBCM) into your trailer's list of features. 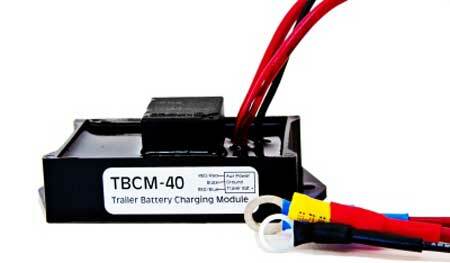 The TBCM will keep the Accessory battery in the trailer charged while the tow vehicle is running. The TBCM-40A from Atkinson Electronics connects the vehicle's auxiliary battery charge wire and the trailer battery positive wire together only when the vehicle's engine is running and the alternator is putting out charge current. When not charging, both vehicle and trailer batteries remain isolated, preventing both from discharging when a trailer load is left on. This isolation continues even if the ignition switch or lights are left on. The TBCM is thermally protected to disconnect in case of internal arcing or other high temperature conditions. 22. Fire Extinguishers — Most enclosed car trailers have wooden floors and walls and carry vehicles that contain flammable liquids like gasoline. 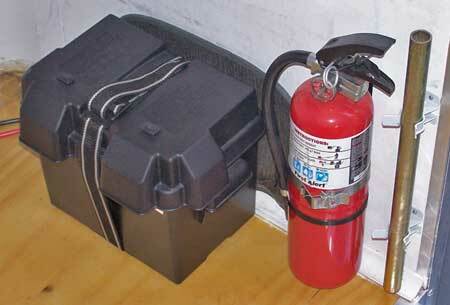 Carrying one or more properly rated fire extinguishers is a must. When deciding on where to mount fire extinguishers, accessibility should be a priority. Mounting them near one or more of the trailer doors is usually where many trailer owners located them. 23. Wheel Chocks — There are a number of wheel chocks available on the market today. Some are made of a plastic/rubber composite and have a simple wedge design. Others are made of metal and are mechanical in nature. Whenever a trailer is not hitched to a tow vehicle, some form of wheel chocks should be used to insure the trailer does not move from its parking spot. Mechanical wheel chocks are available from local or on-line RV retail stores. 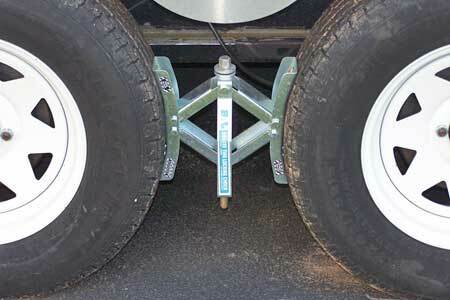 A metal wheel chock is located between the wheels to secure the trailer. 24. Jack Stands — When off loading your collector car, the rear of the trailer must be supported even though it is still hitched to the tow vehicle. The use of screw adjusting jack stands will provide a snug fit between the ground and the trailer's frame. It maybe necessary to include a wooden plank if the ground is soft or likely to leave marks in the asphalt from the stands frame. Threaded screw type jack stands are used to support the rear of the trailer when off loading your collector vehicle. 25. Wood Plank Jack (lift) — The use of Wood Planks as a jack will be invaluable if changing a trailer tire while on the side of the road. Simply locate the planks at the good tire and pull forward (or reverse) to raise that side of the trailer to swap out the damaged tire. A series of wooden planks make a simple way to raise the trailer to change a blown tire. Locate the planks in front (or rear) of the good tire and move the trailer up onto them. 26. Locks — Think about the locks you'll use. Having the locks all keyed alike saves frustration in finding the right key. This includes the pad locks on all the doors and the hitch (ball) lock. 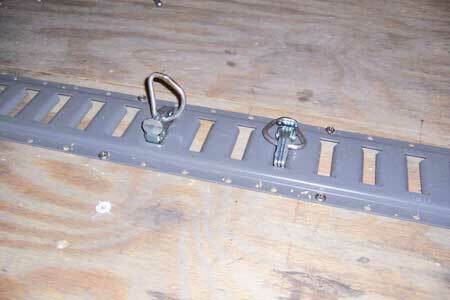 Consider a Hitch Lock that mounts into the hitch ball socket to deter trailer theft. Heavy chains between the wheel spokes are also a deterrent. 27. Research how you'll be using your truck and trailer. Take the time to understand the weights mentioned as it applies to you. Look at other people's truck and trailer arrangements and don't be afraid to ask questions. The dumbest question is the one that didn't get asked. Learn from other peoples' experiences. Take the time to plan where and how everything in your trailer will be placed. Layout where accessories will be stored. The E-Track system makes their product with both vertical and horizontal slots, so using it on the trailer's inside walls is also possible. This allows multiple tie-down points for boxes and parts or tools. Understand how your trailer's accessories such as inside lights are operated. Some tow vehicle's trailer connector only provide 12 volt power while the ignition is on. Is this what you want? Consider ways to change this. As suggested when we discussed the back-up lights, maybe you want back-up lights for use when backing, but have separate flood lights mounted high that are switched on independently of the reverse lights. 28. Storage — When storing your trailer for long periods, consider a special trailer cover to protect it from the sun and elements. Weather can wreak havoc on an unprotected unit, especially the seams and moldings. Consider using small jack stands on the rear frame members and in conjunction with the tongue jack to take some of the weight off the springs while in long term storage. 29. Maintenance — The trailer you are considering requires maintenance just as much as the vehicles themselves. Maintenance tasks include greasing suspension components, the hitch ball, and wheel bearings; checking tire pressures and their overall condition; cleaning electrical connections and checking lighting and electric brake operation. On the trailers exterior, lubricate door hinges and lock hasps. Be sure to look for moldings and trim that may have worked loose. Credits: Thanks to John Tritle with photos by Charlie Russo for some of the tips listed in this article.